Hoover the tiger, Mufasa the mountain lion and Condorita the condor have been removed from two circuses in northern Peru during raids as part of Animal Defenders International’s mission to enforce Peru’s ban on the use of wild animals in circuses, Operation Spirit of Freedom. 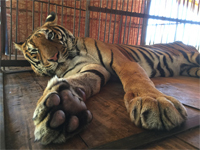 After ADI received tip-offs that two circuses were illegally operating with wild animals in the area, we moved in with Peruvian authorities ATFFS Piura and the police. Both circuses heavily resisted the legal action, with riot police and the Public Prosecutor called in to secure the condor and mountain lion during a long and hostile stand-off. Almost 80 animals have been rescued from circuses and the illegal wildlife trade during the Operation Spirit of Freedom rescue mission so far, which will culminate in June with a huge airlift of 33 lions, a bear and now Hoover the tiger to their forever homes in the US. ADI is also relocating nearly 50 native wild animals to a specially built facility at Pilpintuwasi near Iquitos in the Amazon with the Peruvian Air Force providing an aircraft for the animals and the Navy providing river transport. Help ADI care for the animals and get them to their forever homes! Hoover the tiger was removed from Circo Africano, the same circus that Cholita, an endangered Andean spectacled bear who has won the public’s hearts, was removed from several years ago. ADI was poised eight months ago to remove two tigers from the circus but it slipped through the net and eluded authorities until now. Hoover is the sole survivor of up to six tigers with the circus. He is thin and will be monitored closely by the ADI veterinary team. ADI was tipped off about the location of the circus via social media and began discussions with ATFFS Piura about the seizure operation whilst continuing to trail the circus. 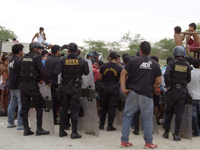 They were then tipped off about another circus in the area, Circo Koreander, the raid on which took place less than 24 hours after the first, in an isolated village in the same area of northern Peru. 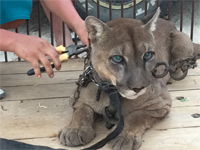 A mountain lion called Mufasa who was kept chained in the back of a pick-up truck was removed by ADI along with Condorita the condor, named after a Chilean comic book character. The heated seizure saw police reinforcements and the Public Prosecutor called in. Legal proceedings are now underway concerning the circus’ obstruction of the seizure and to try and secure a monkey still with the circus. Before ADI began seizure operations with the Peruvian authorities last year, ADI conducted a census of all animal circuses in Peru. Some disappeared as soon as the first seizures took place, but we have steadily tracked down every circus that was on that list and removed their wild animals. It has been public tip-offs to ADI that have led to the seizures on the last three circuses so we urge people to remain vigilant and report any sightings of wild animals in circuses. The ADI Spirit of Freedom flight to the USA had originally been planned for April however ADI, Peruvian authorities SERFOR and ATFFS, The Wild Animal Sanctuary and Denver international Airport all agreed the priority had to be saving the animals, so the airlift has been postponed until June and will now take Hoover the tiger to a new life. Locating and raiding circuses all over Peru and looking after this number of different animals has been a huge challenge and we are now looking forward to getting all of the animals ADI has rescued to their new homes. Please help and make a donation to get Hoover the tiger, Cholita the bear and all the other animals saved during Operation Spirit of Freedom to their forever homes.